Today’s blog post is Part II in our two part series on OCR’ing bank check account and routing numbers using OpenCV, Python, and computer vision techniques. Last week we learned how to extract MICR E-13B digits and symbols from input images. Today we are going to take this knowledge and use it to actually recognize each of the characters, thereby allowing us to OCR the actual bank check and routing number. To learn how to OCR bank checks with Python and OpenCV, just keep reading. In Part I of this series we learned how to localize each of the fourteen MICR E-13B font characters used on bank checks. Ten of these characters are digits, which form our actual account number and routing number. 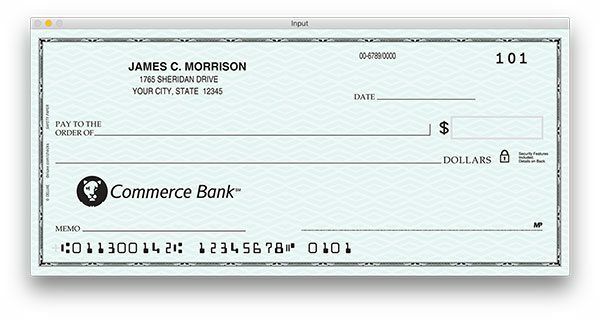 The remaining four characters are special symbols used by the bank to mark separations between routing numbers, account numbers, and any other information encoded on the check. Figure 1: The fourteen MICR E-13B characters used in bank checks. We will write Python + OpenCV code to recognize each of these characters. Now that we are able to actually localize the digits and symbols, we can apply template matching in a similar manner as we did in our credit card OCR post in order to perform OCR. In order to build our bank check OCR system, we’ll be reusing some of the code from last week. If you haven’t already read Part I of this series, take the time now to go back and read through it — the explanation of the extract_digitis_and_symbols function is especially important and critical to localizing the bank check characters. Install OpenCV using the relevant instructions for your system (while ensuring you’re following any Python virtualenv commands). Note: for any of the pip commands you may use the --upgrade flag to update whether or not you already have the software installed. This function has one goal — to find and localize digits and symbols based on contours. This is accomplished via iterating through the contours list, charCnts , and keeping track of the regions of interest and ROI locations ( rois and locs ) in two lists that are returned at the end of the function. In the above code block, we have determined that a contour is part of a special symbol (such as Transit, Dash, etc.). In this case, we take the current contour and the next two contours (using Python iterators which we discussed last week) on Line 41. These parts of a special symbol are looped over so that we can calculate the bounding box for extracting the roi around all three contours (Lines 46-53). Then, as we did before, we extract the roi and append it to rois (Lines 56 and 57) followed by appending its location to locs (Line 58). Once we have reached the end of the charCnts list (and there are no further entries in the list), a next call on charCnts will result in a StopIteration exception being throw. Catching this exception allows us to break from our loop (Lines 62 and 63). Finally, we return a 2-tuple containing rois and corresponding locs . That was a quick recap of the extract_digits_and_symbols function — for a complete, detailed review, please refer to last week’s blog post. Lines 69-74 handle our command line argument parsing. In this script, we’ll make use of both the input --image and --reference MICR E-13B font image. Lines 83 and 84 build a list of the character names including digits and special symbols. Then, we load the --reference image while converting to grayscale and resizing, followed by inverse thresholding (Lines 89-93). Figure 2: The MICR E-13B font for the digits 0-9 and four special symbols. We will be using this font along with template matching to OCR our bank check images. Reference image contours are computed on Lines 97 and 98 followed by updating the refCnts depending on which OpenCV version we are running (Line 99). We sort the refCnts from left to right on Line 100. We call the extract_digits_and_symbols function on Lines 104 and 105 providing the ref image and refCnts . We then initialize a chars dictionary on Line 106. We populate this dictionary in the loop spanning Lines 109-113. In the dictionary, the character name (key) is associated with the roi image (value). We’ll apply a rectangular kernel to perform some morphological operations (initialized on Line 117). We also initialize an output list to contain the characters at the bottom of the check. We’ll print these characters to the terminal and also draw them on the check image later. Lines 123-126 simply load the image , grab the dimensions, and extract the bottom 20% of the check image. Note: This is not rotation invariant — if your check could possibly be rotated, appearing upside down or vertical, then you will need to add logic in to rotate it first. Applying a top-down perspective transform on the check (such as in our document scanner post) can help with task. Figure 3: The example input bank check that we are going to OCR and extract the routing number and account number from (source). On Line 131 we convert the bottom of the check image to grayscale and on Line 132 we use the blackhat morphological operator to find dark regions against a light background. This operation makes use of our rectKernel . Figure 5: Applying black hat morphological operation reveals our bank account number and routing number from the rest of the check. Using our blackhat operator, we compute the Scharr gradient with the cv2.Sobel function (Lines 136 and 137). We take the element-wise absolute value of gradX on on Line 138. Figure 6: Computing the Scharr gradient magnitude representation of the bank check image reveals vertical changes in the gradient. On Line 146, we utilize our kernel again while applying a closing operation. We follow this by performing a binary threshold on Lines 147 and 148. Figure 7: Thresholding our gradient magnitude representation reveals possible regions that contain the bank check account number and routing number. Figure 8: To help remove noise we can clear any connected components that lie on the border of the image. On Lines 156-158 we find our contours also take care of the pesky OpenCV version incompatibility. Next, we initialize a list to contain our number group locations (Line 159). Looping over the groupCnts , we determine the contour bounding box (Line 164), and check to see if the box parameters qualify as a grouping of characters — if they are, we append the ROI values to groupLocs (Lines 168 and 169). Using lambdas, we sort the digit locations from left to right (Line 172). Figure 9: Applying contour filtering allows us to find the (1) account number, (2) routing number, and (3) additional information groups on the bank check. In the loop, first, we initialize a groupOutput list which will later be appended to the output list (Line 177). Subsequently, we extract the character grouping ROI from the image (Line 182) and threshold it (Lines 183 and 184). For developmental and debugging purposes (Lines 186 and 187) we show the group to the screen and wait for a keypress before moving onward (feel free to remove this code from your script if you so wish). We find and sort character contours within the group on Lines 191-195. The results of this step are shown in Figure 10. Figure 10: By using the (x, y)-coordinates of the locations, we can extract each group from the thresholded image. Given the group, contour detection allows us to detect each individual character. On Line 198, we provide the group and charCnts to the extract_digits_and_symbols function, which returns rois and locs . We loop over the rois , first initializing a template matching score list, followed by resizing the roi to known dimensions. We loop over the character names and perform template matching which compares the query image roi to the possible character images (they are stored in the chars dictionary and indexed by charName ) on Lines 212 and 213. To extract a template matching score for this operation, we use the cv2.minMaxLoc function, and subsequently, we append it to scores on Line 215. The last step in this code block is to take the maximum score from scores and use it to find the character name — we append the result to groupOutput (Line 220). You can read more about this template matching-based approach to OCR in our previous blog post on Credit Card OCR. Next, we’ll draw on the original image append the groupOutput result to a list named output . Lines 224 and 225 handle drawing a red rectangle around the groups and Lines 226-228 draw the group output characters (routing, checking, and check numbers) on the image. Finally, we append the groupOutput characters to an output string (Line 231). We print the OCR results to the terminal, display the image to the screen, and wait until a key is pressed to exit on Lines 234-236. Let’s see how our bank check OCR system performs in the next section. To apply our bank check OCR algorithm, make sure you use the “Downloads” section of this blog post to download the source code + example image. 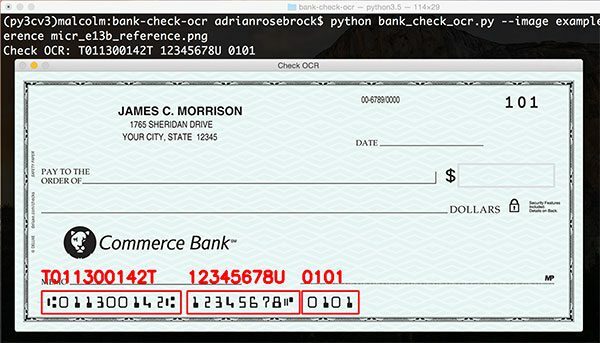 Figure 11: Using OpenCV and Python, we have been able to correctly OCR our bank account number and routing number from an image of a check. In this particular example, we were able to get away with using basic template matching as our character recognition algorithm. However, template matching is not the most reliable method for character recognition, especially for real-world images that are likely to be much noisier and harder to segment. In these cases, it would be best to train your own HOG + Linear SVM classifier or a Convolutional Neural Network. To accomplish this, you’ll want to create a dataset of check images and manually label and extract each digit in the image. I would recommend having 1,000-5,000 digits per character and then training your classifier. From there, you’ll be able to enjoy much higher character classification accuracy — the biggest problem is simply creating/obtaining such a dataset. Since checks by their very nature contain sensitive information, it’s often hard to find a dataset that is not only (1) representative of real-world bank check images but is also (2) cheap/easy to license. Many of these datasets belong to the banks themselves, making it hard for computer vision researchers and developers to work with them. In today’s blog post we learned how to apply back check OCR to images using OpenCV, Python, and template matching. In fact, this is the same method that we used for credit card OCR — the primary difference is that we had to take special care to extract each MICR E-13B symbol, especially when these symbols contain multiple contours. However, while our template matching method worked correctly on this particular example image, real-world inputs are likely to be much more noisy, making it harder for us to extract the digits and symbols using simple contour techniques. In these situations, it would be best to localize each of the digits and characters followed by applying machine learning to obtain higher digit classification accuracy. Methods such as Histogram of Oriented Gradients + Linear SVM and deep learning will obtain better digit and symbol recognition accuracy on real-world images that contain more noise. If you are interested in learning more about HOG + Linear SVM along with deep learning, be sure to take a look at the PyImageSearch Gurus course. And before you go, be sure to enter your email address in the form below to be notified when future blog posts are published! Cool. Can this functionality be reproduced w R? Hi Dan — I don’t have much experience with the R programming language so I’m not sure if this method could be easily reproduced with R. Check to see what types of OpenCV bindings R has (if any). Could it be reasonable with CMC7 font too ? The CMC7 font is a little more challenging due to the vertical lines, but yes, the same technique could be applied. Can you let me know how to do that with the help of Open CV. What you’re referring to is handwriting recognition. I would suggest using the Google Vision API as a first attempt and seeing how far that gets you. Creating your own OCR system for unconstrained handwriting recognition is quite challenging. I do not recommend implementing it from scratch. Thank you so much for the blog posts. I am starting now studying and understanding this new area. I would like to develop a program to extract text from receipts and recognize them. The problem that We can find different fonts types in those receipts. For this case should we use HOG and linear SVG ? What should I use to train the model ? Is there already some database that could be used ? HOG + Linear SVM would be a good start if your fonts are similar. If your fonts vary dramatically you will likely need a more advanced object detection method likely relying on deep learning. Take a look at the HOG + Linear SVM post I linked to earlier in this comment and from there take a look at the PyImageSearch Gurus course where I cover how to implement and train your own object detectors. I hope that helps!